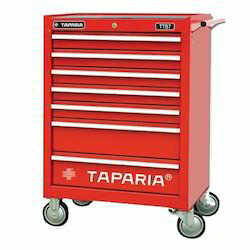 Our range of products include taparia tools trolley. Reinforced double wall frame with single piece casting enables high strength and long life. High-quality ball bearing slides enable smooth drawer opening. Rear locking system avoids opening of the drawers. The Castors are smooth, strong & chemical resistant and have a load capacity of upto 550lbs. Superior powder coating on the cabinates gives extra rust protection and good looks.